Average Continuous Black Declared Cartridge Yield up to 6,000 standard pages in accordance with ISO/IEC 19798. Lexmark offers customers a broad choice of laser toner cartridges and recycling options including easy return to Lexmark. 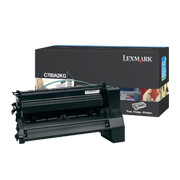 For superior results always use genuine Lexmark supplies.